Editing is a time consuming and creative process. It’s where the video takes shape. 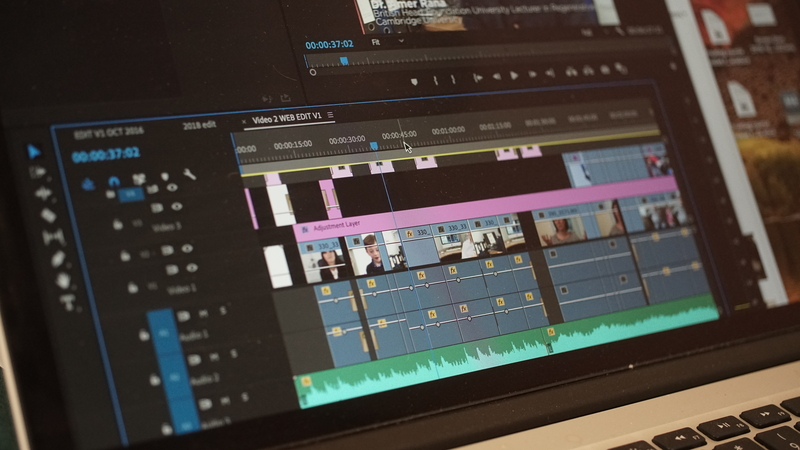 Modern laptops and basic editing software will allow you to join shots together and build a sequence. File management is critical. You will end up with dozens and sometimes hundreds of separate asset files so keep them in one place and label them clearly. Confusion is easy to create if you don’t have a good asset management folder system in place. We can’t stress this highly enough. What we do is to create two sub folders in the main project folder, one for assets and one for exports. Store anything that is an asset in the asset folder and leave the export folder for later file exports. The first step is to ingest all the shot material into the system. Depending on your particular camera, this will vary. Most cameras these days record to memory cards which tend to be expensive and consequently re-used. So our advice is to copy the material twice onto two separate hard drives. This will cover you should one drive be lost, stolen or break. We have seen them all! So having two stored versions avoids disaster later. Once ingested into the computer and the editing software opened, create a project and save it in the project folder. Next import all the material into the project and create separate bins. This again makes it easier to navigate around the project. Perhaps have one bin for interviews, another for cutaways, another for music and another for other assets. We recommend that transcriptions are created for any interviews. This is time consuming but it allows you to see on paper what was said. We break these down into answers and give each one a unique number. It is easier to talk in reference numbers than describe the contents of each paragraph. Do a paper edit first. By that we mean cut and paste the best interview answers or voice over script in a word document and assemble this in the right order. This is the best way to start the edit process. It’s clear to see at a glance which bit goes where to tell the story. Once this is done assemble the shots in this order. If you are using a voice over commentary it is normal practice for one of the edit team to record a scratch commentary which can be finalised in time and then replaced with a professional voice when needed later. Once the narrative element of the video is laid down you can then set to work on the pictures. Choose the shots that best illustrate the point. Depending on the pace of your video, this will dictate the length each shot appears for. You should cut the speed of the pictures sympathetically with the story, and avoid unnecessary and fancy editing transitions that detract from the story. If you have shot it right you will have lots of editing choices. Avoid what are called jump cuts which is where two equally sized shots appear one after the other. The picture jars. Try to blend in wide shots and close shots together. This makes the video more engaging. If your software allows you, build up the sequence in a series of layers with voice-over on one layer, interviews on another and cutaways and graphics on another. This makes things easier and clearer to see as the project gains complexity. The edit timeline becomes a complicated jigsaw puzzle but keeping things clearly laid out makes it easier to keep on top of the project. Save the project at 10 minute intervals. From experience having a computer crash and losing hours of work is frustrating to say the least!